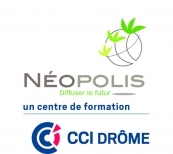 NEOPOLIS is a French training centre dedicated to sustainable development. It belongs to the Chamber of Commerce and Industry of Drôme, located 100 km south to Lyon and few kilometers from Alpin Vercors mountains. It provides more than 70 000 hours of training in: wood construction, sustainable building/energy efficiency, sustainable trade; in 2012, Neopolis has inaugurated a 2000m2 workshop area, offering a unique practice place for trainees in building fields. Experienced in pedagogical engineering, Neopolis is approved at regional level for its competences concerning energy efficiency and building retrofitting. In the scope of the Alphouse project, Neopolis has developed his knowledge in older buildings retrofitting and can supply public authorities and SMEs with training/information about this topic. Neopolis also participates to a EIE project (REE_TROFIt) whose results could be evaluated in AlpBC. Neopolis rely on a solid network of experts and maintains a close partnerships with professional organizations, clusters (Cluster Eco Energy Rhone-Alpes), energy associations (RAEE, ADEME, VAD) and local public authorities. Neopolis is identified at national level as a key actor to consult the elaboration of national orientations for build up skills in energy efficiency.